Nick Yarbrough placed second in the Adonis Index Contest in the Open category. Nick’s after pictures are incredible. You would not guess that he is only 21 years old. His muscles really show in these photos and he is living proof that with effort comes great results. You would say that Nick was in a pretty good shape even in his before pictures. However, he had to lose about 18 pounds of fat and water to get from a pretty good shape into an amazing shape. Nick has achieved an amazing condition. Nick has been working out for some time now. He played football and started lifting weights when he was 15. But because he played football, his workouts were based mostly on improving his performance and gaining strength and not on improving his physical look. All he wanted was to get bigger. So Nick started working out 3-4 times per week. That would not be so bad if he had a good workout. Unfortunately his workouts were anything but good. When he was in a gym he would just do random lifts and not really plan ahead. One day he would go to the gym and do bench press, a few curls, some rows and go home. Next day he would do some squats and maybe bench press one more time and once he go tired he would go home. After a year of eating ‘like hell’ he gained 25 pounds and went to up to 190 pounds. At the end he achieved his goal, he got bigger. But not in a way that he liked. 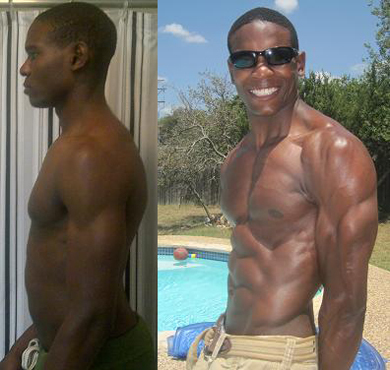 He thought at 190 pounds he’d be big and ripped, not big and fat (his own words). After a while he found the Adonis Index and just out of curiosity calculated his own Adonis Index ratio. The ideal ratio of your shoulders to your waist aka Adonis Index is exactly 1.618. Nick said that he expected to be around 1.5 or at least 1.4. Well long story short his real indicator of how good shape he was in was much lower, it was 1.2. Despite the fact that he worked out and had some muscle mass on his shoulders, his Adonis index ratio was still incredibly low, this was due to the fact that he carried a lot of fat around his waist. Finding this was tough. He couldn’t believe that he had to lose that much fat to get in shape. However, if he wanted to get to the golden 1.618, his lifestyle had to change. He committed to his goal and dropped to 175 pounds. After losing that much fat, his shoulder-to-waist ratio of course went up. After this weight loss transformation he got to a pretty decent shape. Now if he wanted to take it to the next level he would have to undergo a similar transformation. However, he didn’t want to lose more fat, because he was actually afraid of being too light. He thought that he had to just lift harder and muscles will show up…eventually. This lasted for about a year. 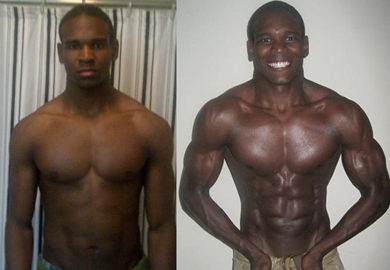 Then he saw the transformation the other guys made in one of the past Adonis Index contests. After seeing this he decided to diet again and dropped down to 157 pounds. He went back to his high school weight, only this time it was mostly muscle mass not fat mass. Once he got there he was amazed by how good he looked. He didn’t expect his muscles to be so incredibly defined and still couldn’t believe how light he actually was at the end. His friends think that he is at least 180 pounds. All from the illusion that he created by getting ripped and to a golden Adonis Index ratio. You are probably eager to know what Nick did to get to that super cut shape. Fat loss is all about calories in and calories out. You need to create a long term caloric deficit to see noticeable results. What varies from person to person is the approach – and how quickly are you going to achieve that deficit. We are all different and what might work for you might not work for Nick. The way Nick did it was that he split the week into two types of days. On the workout day, he wasn’t hungry at all. So this was a low calorie day for him, the day that he would use to create a big deficit. The next day he would rest and eat little bit more, he would use this as a “refill” for the next day, because he wanted to have enough energy for the upcoming workout. What this means is that he ate the night before to feel better during his workout the following day. Here is an example. If he happened to work out on Monday, he would fast until the workout, do the exercise and go home. Usually he would not be hungry until a couple of hours afterwards, so he would fast for about 20-24 hours every second day. After the fast he would eat a low calorie dinner, some chicken breast or fish, roughly around 1000 to 1500 calories. If he went to work after the workout, he might throw in a protein shake before the dinner. If Monday was workout and low calorie day, Tuesday would be rest and higher calorie day. On this day he would try to fast as long as he could and then have a big dinner, for example some pasta or a hamburger. The way he looks at this is that on the day you don’t work out, you eat more, because you are getting ready for the workout. On the other hand workout day is the burn day. This seems like a good idea, because on the day you work out it is easier to control your appetite. You also don’t want to overeat and “spoil” your day, because you already did some work in the gym (no matter how ridiculous this sounds, you probably know this from your own experience, simply put exercise affects your diet). However, on the day you don’t work out, you need to satisfy your appetite and also refill for the next workout to be able to push hard. Nick took this approach and you saw his great after pictures. If we look at those two days in total, Nick would burn about 4000 calories and eat only 3000 calories. This is about 45000 calorie deficit in three months, roughly around 12 pounds fat loss. Because Nick was also working out he burnt some extra pounds just from the workouts itself. Nick went through about 50 workouts in those 12 weeks, he burnt another 6 pounds of fat (and water) just by creating a bigger deficit from this physical activity. In total you get almost 18 pounds of fat. When Nick saw the pictures he was surprised by how 157 pounds looks like, he thought it would look way skinnier. This is a common misconception. It would even seem that being too light is not very manly and that in order to get in shape we would need to give ourselves permission to get light to get lean. Nick ended up at the weight he was in high school, but obviously the muscle-fat ratio was completely different. This is just proof of how body weight tells nothing about how you look in a mirror. At the end Nick completely abandoned the concept of eating big to get big. Because you can’t really eat your way up to bigger muscles. First of all, muscle growth is a response that is stimulated by working out not eating (that’s a shame, wouldn’t it be nice to build your chest just by eating more chicken?). Second, there is a limit on how many pounds of muscle you can build, the only difference is how quickly you can do it.